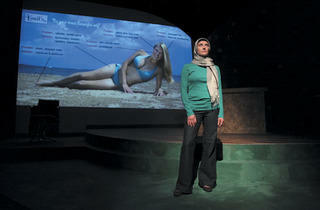 A billboard touting cosmetic surgery sparks controversy in Mia McCullough’s new play. The oversized advertisement causes a public uproar and sparks debate on how the female body is depicted, with model Talya (Melanie Derleth) trapped in the middle. McCullough puts the play’s message above character and plot, providing information in a presentational, monologue-heavy style. With actors delivering chunks of text while standing next to each other but not interacting, the pace can be plodding. When the playwright sporadically chooses to show rather than tell, these characters rise above the ideological stance they represent and become real people. Derleth serves as a strong emotional anchor, playing Talya with a steely confidence that shields her vulnerable soul. As a bitter barista trapped in the ’burbs, scene-stealer Jennifer Pompa gets the best one-liners, but is equally sharp during intimate dramatic scenes. Her character has the most distance from the central conflict, allowing Pompa to create a distinct personality that’s affected, but not defined, by the words in the advertisement.